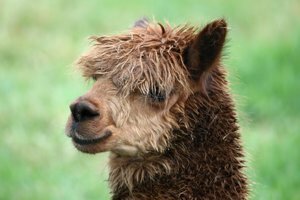 This is a story about defensive blindness – insights thanks to Butterscotch the alpaca, a garage door, and a haircut. Every morning our alpacas move from the front field to the back. When we first took over the herd, they would follow our lead. We would open the first gate and they would follow us as we walked (or sometimes ran, in order to stay in the lead) through the back gate and into the back field. It didn’t take long, however, for the alpacas to master the routine, to the point where our guiding presence was no longer needed. Once that first gate was opened, it was Game On, and they would rush past to get to the grass on the other side. It came to our attention one day that while six of the alpacas managed to run directly to the other field, Butterscotch seemed to be missing the passage way and heading straight into the garage door! We observed this for a few days in a row, watching him run into obstacles, falter, and gradually find his way back. From our vantage point it looked like he was running into the garage on purpose. But we knew that didn’t make sense. We guessed that maybe there was something wrong with his eyes, so on the next morning herd we attempted to step in just before he hit the garage. My husband kept him firmly in a tackle hold (alpacas, by the way, do NOT like to be held!) while I looked for signs of what was wrong. It didn’t take long to realize the problem. Butterscotch needed a haircut! His fibre (the alpaca version of hair) had grown right over his eyes, making it tricky to see anything. The poor guy had been bumbling about in his alpaca world, trying to find his way to the field or to the hay, and not always succeeding. The solution was clear. He needed a haircut and there was no time like the present. It didn’t matter that my hair-cutting skills left much to be desired – it needed to be done and I was in the best position in that moment. Scissors were found, and while my husband worked hard to keep him still, I attempted to free Butterscotch’s eyes. It wasn’t the prettiest haircut, but I don’t think the alpaca minded a bit. He seemed to give a shudder of relief as he broke free and ran off – this time in the right direction. Crisis (and vet bill) averted, we too breathed a sigh of relief. While I thought about what had transpired with Butterscotch and his apparent blindness, it brought to mind something I had observed in humans. I thought of some of the youth I’d observed at school who would literally walk into trouble, just as Butterscotch walked into the garage door. They didn’t see what they were walking into because they couldn’t read the cues. They didn’t read the lack of invitation in someone’s eyes or voice, or the hints in body language, and so they would forge ahead where they weren’t invited and find themselves in situations that were awkward for those around them. Inevitably they would find themselves in trouble – either literally or figuratively. Maybe you’ve seen this, too. However, while Butterscotch’s blindness came from the hair growing over his eyes, the same could not be said for the students I observed. This was coming from a different place. Something internal. It was still a kind of blindness, but rooted in defense. Basically the brain was blocking out anything that it deemed too hard to look at, too vulnerable, or too alarming. Like Butterscotch’s hair in front of the eyes that prevented key things from being seen, our natural defense system can inhibit what we take in from our world. It interferes with what we feel, or our ability to tune in to what is in front of us (sometimes for very good reason!). And this can look like blindness. So if a child’s brain has tuned out a failing grade, or a lack of invitation, then it doesn’t sink in. It doesn’t register. And the child remains blind. While this helps them function in a wounding world, it can make certain things more challenging: their attention may be scattered; things may be awkward socially; they may run into more trouble than a garage door. And, unfortunately, in this case a haircut won’t solve the problem. The way through defensive blindness is to come alongside the child, the adolescent, or even the adult, and do what the brain is trying to do – to protect and to make things safe. These children need a shield from all the incoming arrows that are too much to bear; at the same time, they need a safe place to help them see, and sit with, some of the difficult stuff, in a way that feels do-able and not over the top. In a context of connection and within the safety of our shield, we can help them tune in, ever so gently, to the situations that are hard to face and to the emotions that are hard to feel. We can find ways to bring the alarm down in their world. We can look for where they are facing too much separation from the people and things they are attached to, and find ways to reduce that separation. We can find ways to help them release some of the built up emotional energy – the frustration and the alarm. In fact, all of these things are helpful for any child, regardless of age, not just for those whose defense system is working overtime. It is tempting, though, just to give them a haircut. A haircut would be so much easier.